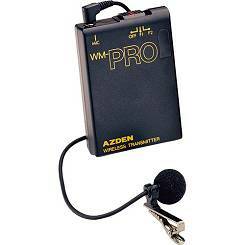 The Azden WL/T-PRO belt-pack transmitter consists of two mail components, the WM-PRO VHF Belt-pack transmitter and the EX-503 omnidirectional lavalier microphone. The transmitter has two selectable channels and will operate from 8 - 10 hours with a single 9v alkaline battery. It is the same lapel microphone and beltpack transmitter as used in the WLX-PRO and can also be with WHX-PRO, WR22-PRO, OR WDR-PRO recievers.